Without fail, anytime our flower bar is stocked with these beauties, people come running. I present to you, the King Protea. The King Protea has the largest bloom in the massive protea family. Native to South Africa, they grow as a shrub and bloom most prolifically in the winter. The large "flower" is actually a collection of tiny true flower heads surrounded by colorful bracts that can be white, yellow, red, or the most sought after, pink. Proteas love extreme weather conditions: dry summers and cold wet winters, so your efforts at growing them in Honolulu will be poorly rewarded. But lucky for us, the temperate climate on the high slopes of the Big Island and Maui provide perfect conditions for these artichoke-like bad boys. We work with a handful of small farms to stay stocked. Cut the stems at an angle when you get home to get them drinking. Keep your kings fresh with water changes every few days and a floral preservative. Make your own preservative with a tablespoon of hydrogen peroxide, a teaspoon of lemon, and a teaspoon of sugar. And did mention they dry beautifully? When your arrangement looks tired, hang the kings upside-down to dry (this helps preserve their shape), then enjoy them for years. Away from the hustle of Kahului and Kihei, centrally closer than the journey to Hana, and embedded in the slopes of Haleakala, lies a pastoral world of hills and ranches. You might even see a real Paniolo (Hawaiian for Cowboy) grilling a grass-fed sustainably-raised elk. Upcountry Maui is a wonderful place to experience Old Hawaii. The buildings and fields form a grand plantation full of stories linking to the mana of the island's past. The weather is cooler, sitting high up the slopes of Haleakala, allowing temperate plants to achieve their full lifecycle including flowering and fruiting. This bounty is apparent driving the snaking roads through Kula and 'Ulupalakua as farm stands pop out of curves bartering juicy starfruit, golden papaya, and beautiful hand-picked protea bouquets grown with love. Ali'i Kula Lavender Farm is located 4,000 ft up Haleakala. 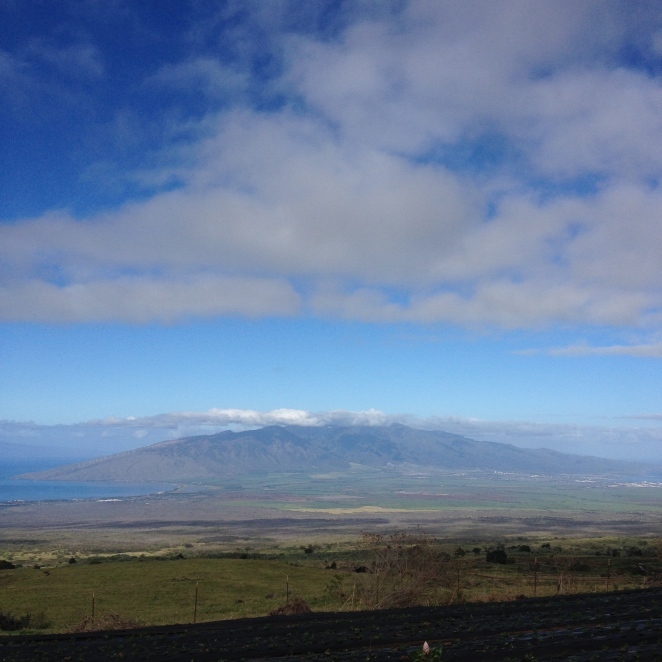 Rolling hills offer vistas of Central and West Maui. Visitors are invited to tour their 13.5 acre farm exhibiting 45 varieties of lavender. The lavender smells like heaven, and begs visitors to roam freely, meditate and relax amongst a well taken care of land. The cool climate of the farm allows them to grow a large number of botanical specimens rare in Hawaii such as hydrangea, apple trees, peach trees, olive trees and more. 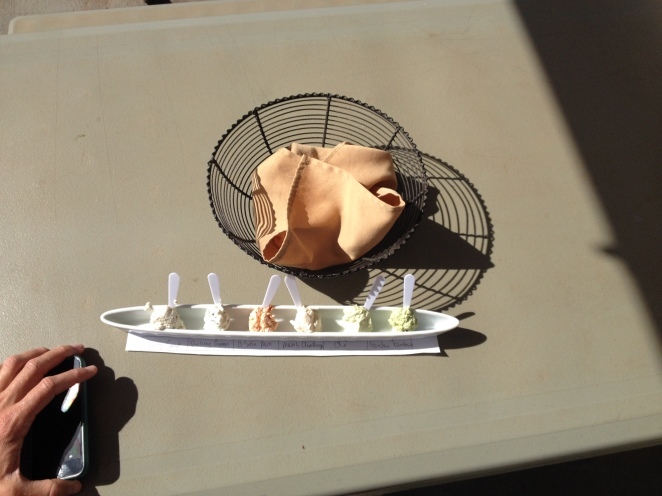 We recommend ordering a cup of lavender tea from their cute cafe to keep you warm throughout your excursion. Surfing Goat is a smelly yet delicious dairy with cute, little goats prancing about. Owned by an expatriate German couple, the 42-acre pasture welcomes visitors to sample gourmet goat cheese (our favorite was called Rolling Green and Garden Fantasia which definitely tasted like an entire garden inside of a scoop of cheese,), play with baby goats, and even milk some if you sign up for the tour. Surfing Goat Dairy cheese can be found in organic supermarkets across Oahu or you can check out their website for additional recipe ideas. Protea are abound in Upcountry, and the farmer's market is always overflowing with flowers. The Upcountry farmers market occurs every Saturday at 7AM to Noon at Kulamalu Town Center. We cant wait to come back and are already planning on the Makawao Rodeo in July! Paiko's fun, tropical modern bud vases are looking extra bright and colorful for summer. Using local flora, these signature pieces are hand created by our creative director Tamara Rigney. At $15 they are the perfect way to brighten up your desk, delight your dinner host, or show a friend some love. One of our favorite flowers at Paiko, protea are bold and beautiful, often looking like they are from another planet. Named after Proteus, the son of Poiseiden, true Protea were originally found in Africa, and South Africa remains the only place in the world where they naturally grow in the wild today. We source all of our protea from upcountry Maui, on the slopes of Haleakala crater. Protea love the cool climate and volcanic soil of this unique Hawaiian environment. Up until a few years ago when the Kilauea volcano became very active, the Big Island also was a major source. Unfortunately the vog from the volcano damages the flowers, so now Maui is the best place for perfect blooms. The protea we use most often for designing are pincushions, kings, and minks. Its amazing they are all from the same family considering their dramatically different appearance. Pincushion protea kind of look like sea anemone, and are one of our staples at Paiko. They come in yellow, orange, red, and salmon tones, and work well when paired with sculptural foliage. Kings are the giants of the protea world. These massive guys can measure up to 10” across when fully open! 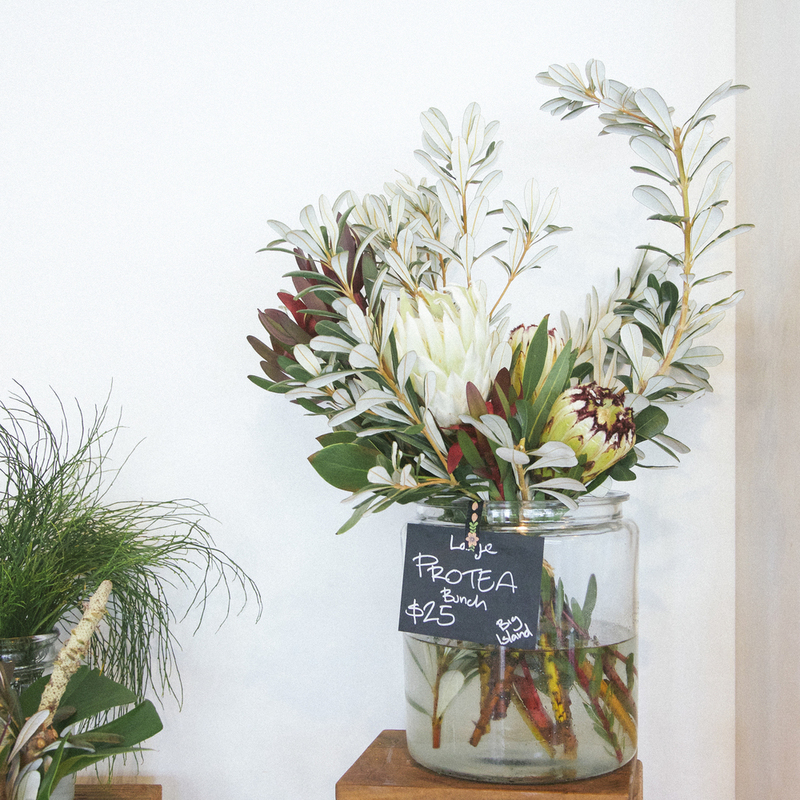 King protea are a statement flower so they look amazing on their own, with a simple accent of curly willow or fishtail palm, or in a loose, romantic, country style arrangement. A single flower makes a great, easy wedding bouquet, either on its own or with an accent of silver eucalyptus. Mink protea are feathery beauties that come in shades of pink, white, and green. One of our favorite Maui varieties is the black tipped pink- so striking! At Paiko we often pair minks with bold green hala foliage, but they also work very well with the silvery tones of eucalyptus. To keep your flowers lasting as long as possible make sure to change the water often, every day if possible, but once every three days at the minimum. A good tip for keeping your protea or any flowers healthy, is to re-cut ½” from stem at each water change. Mink and king protea normally last around a week before they start to fade, pincushions can last up to three weeks.